Developer Quote: "Discovr Movies makes it easy to find a new movie that you'll like." Movies on the big screen, DVD, Blu Ray or your TV are always a great entertainment source, particularly when you are enjoying them with a friend. The problem is that there are so many genres, actors, ratings and differentiating characteristics, it is often hard to pick a movie that suits your tastes perfectly. You hate to spend big bucks at the theater for a movie that didn't transport you to faraway places with its excellence. You need a method to weed through the chaff and find exactly the type of movie you want to spend a couple hours watching. - Single tap to see similar movies. - Tap & Hold for more options. 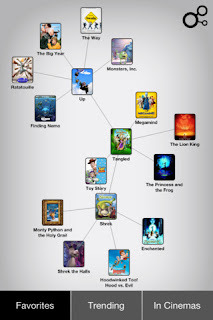 First of all, Discovr Movies is similar to Discovr Music in that you tap on a movie to see it "blooming" and displaying types or "buds" of similar movies. In this way, I like to explain away the Discovr apps technique as "blooming ideas", while other folks see the these apps with their discoverable content as "spokes on a wheel". In any case, tap your way through movies that interest you only to discover similar movies. Check out what's Trending and in Cinemas currently. When you find a movie that looks interesting, view the Synopsis, Cast, Clips, Reviews and helpful Links. Share all this great info with friends via Facebook, Twitter or email, and mark your Favorites too. 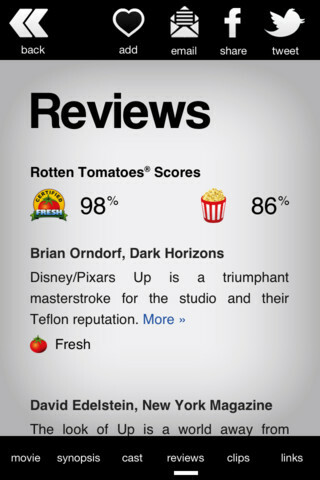 See what Rotten Tomatoes has to say about the movies that intrigue you. It's amazing how one great movie will lead to another! 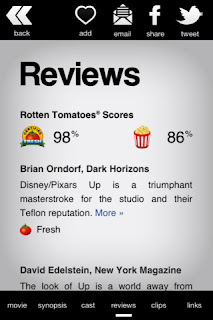 COOL CONCLUSION: "Discovr Movies contains a handy grab-bag of reviews, information and suggestions that will make it easy for you to "discover" movies that strike your fancy!" --iOS/Age Rating: This app requires iOS 4.0 or later. Rated 4+. ~ Note: If you enjoy poetry, surf over to Coffee Table Poetry to relax and read well-known poems from classic poets.